I’m still not over Lance Armstrong. I know his dispassionate confession to Oprah is almost history now, but something else keeps needling me. It wasn’t his admissions to lying and cheating that bothered me so much. It was a casual reference he made that indicated he forgot what he learned from having cancer. After receiving my cancer diagnosis, a friend gave me a copy of his book, “It’s Not About the Bike: My Journey Back to Life.” She said the book inspired her through her breast cancer journey. With some trepidation, I read it before I started my chemo treatments. My doctors advised me not to read stories about the experiences of others because of all the horror stories that get told, but I couldn’t help myself. And, every time I read one, I wished I hadn’t. That’s how I felt about Armstrong’s memoir. I felt compelled to read it, but wished I hadn’t. His stories scared me because his treatments were so intense and brutal, but I kept reading because I wanted to learn how he got through it, what it taught him, and how it changed him. I couldn’t help but wonder, did his laser focus on the victory with all his self-proclaimed defiance and arrogance, cause him to skim over the deeply personal, transformative experience of cancer? While I’m disappointed in Armstrong’s lies, I can’t believe he forgot his cancer lessons. While cancer robs us of so many things, it also gifts us some intangible, pivotal lessons that if used well can enhance and improve our lives. Among those gifts are clarity of purpose, dependence on God, humility, gratitude, perspective, greater appreciation for the human body and the fragility of life, self-respect, the supreme importance of relationships based on trust and honor, and many more. Someone told me my life would forever be divided into two parts — before and after cancer. I balked at that in the beginning, but see the truth of that statement play out more all the time. It’s that profound of an experience. It’s sad that someone can get through cancer or other crucibles in life without ever really learning from them. But, as flawed human beings, we do. We forget the important stuff all the time. It’s like working really hard for a certain goal, achieving it, and then forgetting how hard you worked to get there, who helped you along the way, and what it taught you. Doug recently was telling me about hedonism for some reason, and the theory that we often want something so desperately that we feel we can’t live without it. Then, when we finally get it, it loses its luster and becomes normal, everyday, and overlooked as something special. When it comes to cancer, however, I hope the lessons I learned are part of my DNA. We all have life lessons we need to remember. What are yours? Think about them today and take a minute to honor your experiences and lessons. I promise you’ll be a better person for it. 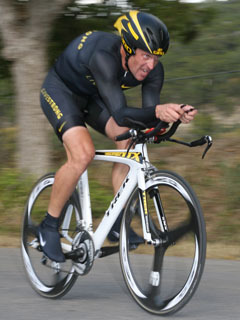 There are many lessons I need to learn from Lance Armstrong’s mistakes. The most important one is to never forget what matters in life. As Armstrong listened to his son, Luke, defend him to his friends, he realized, he had to tell his son the truth. He told him to stop defending him because he didn’t deserve it. He had to admit his lies. I never want to have a conversation like that with my children or anybody else. If we don’t remember the lessons from life’s difficulties, what purpose do they serve but to make us miserable? Maybe I need to thank Lance Armstrong for admitting that he forgot what cancer taught him because it reminded me to remember. Several years ago, Oprah recommended a book called A New Earth by Eckhart Tolle. She even held an online class to tell the world about it because she thought it was such an important book to help us awaken to our life’s purpose. I studied that book carefully because it reflected many of my personal and religious beliefs. But when I recommended it to Doug, he raised his eyebrows all funny at me like I’d fallen into some rolling river of philosophical weirdness. Basically, the book is about discovering and developing our divine essence. Tolle’s contention is that most of us identify only with our physical and psychological forms, never realizing that we are more than that. I love the concept that we are full of deep, pure goodness, and that the way to become better is to excavate that goodness like a miner diligently unearthing gold. In theory, most of us know there is a difference between spirituality and religion. Having a belief system doesn’t necessarily make you a spiritually strong person. “In fact, the more you make your beliefs your identity, the more cut off you are from the spiritual dimension within yourself,” Tolle said. In other words, you are more than the voice in your head. We see everything through a veil of self-talk, and unfortunately most of it is negative or laced with worry and fear. What if we could get beyond that and get in touch with our divine essence or the place where all the pure goodness resides? Through all the philosophical blather of the book that Doug teases me about, there is this wonderful and liberating thought: What if I could live believing I am more than my thoughts? What if I could get a sense of my being that has nothing to do with my mind? The real beauty of A New Earth is in that question. Tolle’s teachings line up with ancient beliefs that we have an inner and outer body. Most of the time we are only in touch with the outer body, but when we still the mind, slow the steady flow of pounding thoughts that we let define us, we can find an inner life where there is more beauty, love, and acceptance, and potential than we ever believed was possible. I’m writing about this book today because I need to be reminded of the value of a quieter mind and a more fortified spirit. I need the reminder that I am more than the voice in my head. At the risk of tiptoeing back into the raucous river of philosophical pronouncements, consider this: Thinking is only a tiny aspect of who we are. So even when my brain won’t stop spinning and my body feels weary, if I pause for just a few minutes and breathe a little slower, I can feel my divine essence emerging, reminding me that I am more – and even better — than I think I am. Sometimes we get so caught up in doing things that we forget why we’re doing them in the first place. I had a few life changing thoughts during the months I lived in a chemo stupor simply because cancer drove me to a deeper place. It actually helped me lose some of my dysfunctional thought patterns like that doing more meant being more. But that was five years ago and I’m slowly forgetting some of those lessons. During those months when I couldn’t do much of anything, I realized that doing less didn’t make me less. In fact, it put me in touch with the still, creative, deep, rich essence that was behind, under, and around all the doing. And I think that’s what Eckhart Tolle is trying to teach. My lesson for today is slow down, breathe, and remember that doing more doesn’t mean being more. In fact, like I learned from spending too many days curled up on the couch in a chemo coma, the reverse is actually true. Sometimes doing less gives us more, and reminds us that we are more than the reflection in the mirror.